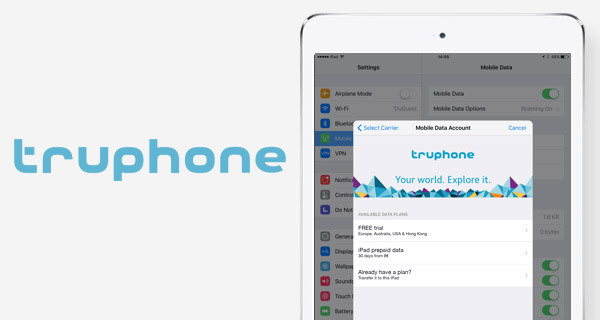 Depending on where you are in the world, you may or may not have actually heard of Truphone, but the world’s first global mobile network has just announced a variety of international mobile data plans for iPad users with Apple SIM. When purchased in Spain, the plans enable iPad owners with an embedded Apple SIM to take the device on their travels in more than 40 different countries, whilst still being confident that they can browse and use data on the device within the confines of the plan at no additional cost. The plans themselves are also designed to be flexible in nature, not only in terms of what the consumer actually receives for the amount of money that they spend, but also in regards to the contract length, or lack of a contract as the case appears to be. Rather than being tied to yet another minimum-term contract, the Truphone Apple SIM plans last for a period of up to 30 days, and give individuals the freedom to roam around 40 different countries without needing to go through the hassle of swapping different SIM cards in and out of an iPad, or worrying too much about cost. Those interested in the plans can opt for 500MB of data for 8€, 1GB of data for 11€, or opt to triple that allowance up to 3GB of data for a single payment of 20€. All of the aforementioned plans last for a period of 30 days and can be used in 40 different countries without additional penalty, including Australia, Austria, Belgium, Czech Republic, Cyprus, the United Kingdom, the United States, Vatican City, the Netherlands, Monaco, Norway, Poland, Hong Kong and more. For those that haven’t experienced Apple SIM previously, it’s an intelligent way of allowing device owners to choose directly which network operator they wish to connect to for data needs without the need to be swapping SIM cards in and out. 9.7-inch iPad Pro model already has Apple SIM embedded into the hardware, while 12.9-inch iPad Pro, iPad Air 2, mini 3 and mini 4 models come with the physical SIM card pre-installed. If your iPad model doesn’t come pre-installed with one but is a supported model, it’s relatively easy to purchase an Apple SIM from an Apple retail stores. If you are in Spain and interested in Truphone’s plans for Apple SIM on your supported iPad, simply navigate to Settings > Mobile Data > Set Up Your Mobile Data and view the Truphone plan with free 100MB data to test out the service. Truphone is said to be working on expanding purchase support of these plans across more countries in Europe. Does Apple Sim Card work on iPhone?